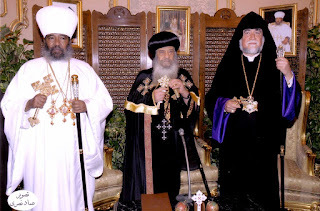 "The EOTC Holy Synod held its 24th session"
The "legitimate Holy Synod" of the Ethiopian Orthodox Tewahedo church in exile lead by his Holiness Abune Merkorios, Patriarch of The Ethiopian Orthodox Tewhahedo Church, successfully completed the Holy Synod's 24th session in Columbus, OHIO on November 10, 2007. It was the first conference held in the new Ethiopian Millennium. 2. embarrassing of all times. But that will never ... the legality of an exiled "synod". Two negatives will never result One positive. Please try to find the right solution. Stop your anti-Orthodox tradition "synod". Try to reconcile with each other. Do not help the Abune Paulos group to further manipulate your mistakes. Albert Speer, the Nazi minister for armaments, recalled in his diary: "It was almost as if [Hitler] was in a delirium when he described to us how New York would go up in flames. He imagined how the skyscrapers would turn into huge blazing torches. 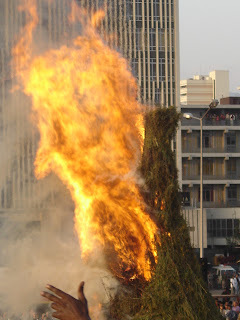 How they would crumble while the reflection of the flames would light the skyline against the dark sky." Hitler hated Manhattan. It was, he said, "the center of world Jewry." Less than 60 years later, Hitler's plans were executed by Muslim immigrants living in Germany. At the 2003 trial of the network around Mohamed Atta (the pilot who flew into the World Trade Center), Shahid Nickels, a German convert to Islam and a friend of Atta's, said that the Islamists had targeted Manhattan because it is "the center of world Jewry, and the world of finance and commerce controlled by it." The parallels between Nazism and Islamism are overwhelming. Yet the subject is a taboo. When last March the German historian Matthias Kuentzel, author of "Jihad and Jew-Hatred: Islamism, Nazism and the Roots of 9/11," was to give a lecture at the University of Leeds (Britain), the university authorities cancelled the lecture after threats from Muslim students. There is a war going on between the Jihadists and the West. We are losing the battle because, as so often in man's history, our political leaders think that they are still fighting the previous war. Europeans who warn against the danger of Islamism are considered — and sometimes even prosecuted — as xenophobes, racists, even neo-Nazis. The European left, in league with the Islamists, is constantly reminding the Europeans of Hitler and the Nazis, accusing Europe's identity, the very core of its being, of being intrinsically evil. Hence, attempts to rob Europe of its identity are seen as "good," even when those eager to eradicate this identity leave no doubt that they will eradicate the Jews first. Unfortunately, some American "conservatives" are also blind. Last year, Ralph Peters wrote in the New York Post that Europe's identity is stained by "ineradicable viciousness." He said that the Europeans are "world-champion haters," who have "perfected genocide and ethnic cleansing." Mr. Peters' message is similar to that of Ayyub Axel Koehler. Last June, Mr. Koehler, a convert to Islam and the chairman of the German Council of Muslims, told German church leaders that Europe should be ashamed of the "trail of blood" that it had left throughout the world down the centuries. To some, defending Europe's identity is seen as a characteristic of neo-Nazism, while they fail to realize that Hitler's real successors are the Jihadists. To many Europeans it now seems that the only way in which Europe can atone for the crimes of the Holocaust is by looking on passively while others prepare a new holocaust. And so, ironically, Hitler will get his way and win the war after all. Contrary to what is generally acknowledged, the Fuehrer did not care about Europe's or even Germany's identity. Those European nationalists who today take their inspiration from Charles Martel, the Germanic leader who beat the Arabs in 732 at the Battle of Tours, cannot be neo-Nazis for the simple reason that Hitler explicitly wished Martel had lost the battle. "Had Charles Martel not been victorious," Hitler told his inner crowd in August 1942, "then we should in all probability have been converted to Mohammedanism, that cult which glorifies the heroism and which opens up the seventh Heaven to the bold warrior alone. Then the Germanic races would have conquered the world." Hitler told Mr. Speer that Islam is "perfectly suited to the Germanic temperament." If the Muslims had won in Tours, the whole of Europe would have become Muslim in the 8th century; and "the conquering Arabs, because of their racial inferiority, would in the long run have been unable to contend with the harsher climate and conditions of [Europe]. They could not have kept down the more vigorous natives, so that ultimately not Arabs but Islamized Germans could have stood at the head of this Mohammedan Empire." Today, Germany, like the rest of Western Europe, is rapidly turning Islamic. In addition to the many Muslim immigrants, 4,000 Germans convert to Islam each year. As always the converts are among the most radical. Last September, Fritz Gelowicz and Daniel Schneider, two young German converts to Islam, were arrested as they were preparing to bomb Frankfurt International Airport. Hitler would have been proud of them. And he would have loathed the so-called "racists" who worry about their country losing its national identity. ADDIS ABABA, Ethiopia (AP) — Students at Ethiopia's top religious college are protesting the close ties between the Ethiopian Orthodox Church and the government, alleged restrictions on their speech — and Beyonce's recent meeting with their patriarch. The 26-year-old singer met with the Ethiopian patriarch, Abune Paulos, before performing in skimpy sequined outfits as part of celebrations of the country's millennium, which fell in September, according to the church's calendar. Daniel Techale, a 28-year-old Theological College of the Holy Trinity alumnus who lives at the college, said about 30 of his friends had been hospitalized after a hunger strike they began Sunday. He said students were upset by the closeness of the church to the ruling party and restrictions on their speech, but were also upset over the Beyonce-Paulos meeting. "She provoked the whole situation," he said, accusing the patriarch of "practically a nonreligious act. It's unacceptable, or inappropriate, to say the least." Authorities were trying to persuade the students to end their hunger strike, he said. The college has 196 students training to work at the church, although not as clergymen. The Orthodox Church is Ethiopia's largest, claiming 45 million out of 77 million citizens as members. It is considered to be very close to the government. College official Bedilu Assefa confirmed that students had complained, but said: "What they have done is they have raised some administrative issues regarding food and clinical facilities. Nobody has protested against Beyonce. Never." Not all the protesters were concerned with the singer, or even politics. Student Kinetibebeu Assefa, 25, said that he had joined the protest to demand an improvement in cafeteria food and the firing of some college officials. "There is no problem with Beyonce," he said. "But the (cafeteria) food is poisoned." Addis Admas, a newspaper in Addis Ababa has published comments about the meeting of His Holiness Abune Paulos and R & B Star Beyonce. What do you think? Beyoncé Giselle Knowles is an American R&B singer, songwriter, record producer, music video director, actress, dancer, and fashion designer. Knowles rose to fame as the creative force and lead singer of the R&B girl group Destiny's Child, the world's best-selling female group of all time. She staged her songs last week in Addis, and controverstial, she met his holiness the patriarch in Trinity Church, where he invited her to visit the country. The issue has become a talking point among Ethiopians inflaming the indignation Ethiopians have towards the current patriarch. 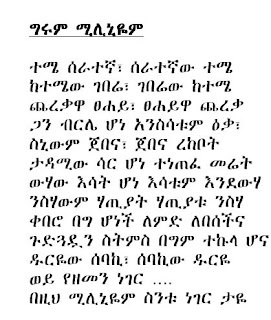 I found an article by a certain Abebe Gelaw worth reading. The U.S. Commission on International Religious Freedom (USCIRF) said today the 23-year-old Islamic Saudi Academy in Northern Virginia is fomenting hate and religious extremism. The U.S. Commission on International Religious Freedom (USCIRF), which advises Congress, the State Department and the president on religious-freedom issues, has issued a 30-page document saying the Saudi Embassy, which operates the 933-student academy, is violating U.S. law. At issue are textbooks the USCIRF says contain "highly intolerant and discriminatory language, particularly against Jews, Christians and Shi'a Muslims." Its findings are based on a three-year study of Arabic-language textbooks, some of them from the Saudi Academy, by the Center for Religious Freedom in the District. 1. A couple of months ago a study made on Iranian school curriculum showed that hatred towards Christians was the basic part of their teaching system. 3. The big question comes here: How about Ethiopia? What are the Saudi funded schools teaching in our country? What is the ministry of education saying about this? If they dare to do their Jihadi education system in the US, why not in Ethiopia? 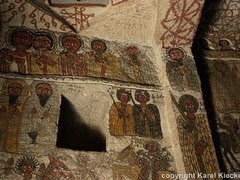 Almost a year ago, a buried church was unearthed in Ethiopia.The church has invaluable historical and cultural value. Striking is that the unearthing is initiated by a man with a dream, as Africanews reporter Tedla Desta found out. However, he had to persue his mission and walk from the upper to the lower official’s chest of drawers but to no avail until finally he went to journalists (the 4th estate). It was then that he realized that media has actually the power to bring about change. From this time onwards the ears and eyes of the executives, congregates and the society at large started to open very widely. Following his insistent claim that he is being haunted by a recurrent dream, that the Virgin Mary was speaking to him about a buried temple, Kasim Alemu Ahmed, with the assistance of the government, interested people and residents of Bole Sub City, Kebele 19, finally unearthed a year ago a buried church, human remains and artefacts. Kasim, a Muslim in his mid forties, said he has been having the same dream for the past seven years. “I have had to go to all government offices which I thought are responsible and accountable to the matter”, Kassim said during the inauguration of the church rebuilt in a modern way, some eight months ago. Upon reaching the area this reporter was able to see land full of trees and no sign showing there could be remains in that area. With the help of some residents living near by, after a few days of the announcement on the media, they dug out features of a well-constructed semi-circular fence made of stones and recovered by human skeletons, giving some clue that there actually is something in that area. These were evidences of the existence of a ‘Tsilat’ and a church at the same site, he said. After these few sightings residents of the area however, have not taken the matter lightly on the people who made the unearthing and on him. According to Kasim, his statements were not welcomed then. “Most residents have been adamant to believe what I have been saying. They fear the discovery of the church and whatever is in it would lead to their eviction from the area. It was not to lose their possession, and also with some secular beliefs that they were opposing us,” he asserts. On the other hand there were many guys who stood by his side. Some gave him moral encouragement while there were others who went on paying the money he was asked by the Government in order to excavate. “Every night in my dream, I was being directed by the Virgin Mary to uncover this house of God,” says Kassim, reminiscing about those times. Some residents have dismissed the man’s claim of “divine guidance,” and state whatever has been uncovered could have been something left at the time of the Italian occupation. Kasim had taken the initiative to collect the signature of willing residents for the excavation and reconstruction of the church. “I am willing to risk my neck, that what I say is the truth and that whatever is buried here is not Italian era. Buried here, and revealed to me by the Virgin Mary is a Holy tablet (Tsilat). I may be a Muslim, but the Virgin Mary has revealed this to me,” Kasim said two years ago. “This dream has haunted me enough. I am now asking all that are in a position to do something about this, to act and help me put this to rest,” Kasim pleaded. Another resident of the same neighborhood, Birhanu Belachew (a Christian) also claimed that he had also dreamt similar dreams. He bizarrely claims that certain people living closely to the area suffer from physical and mental disorders. Long time residents of the area that Capital spoke to say that the ground over the uncovered structure was fully covered with grass and there was no clue that something else existed below it. Church people who had come to dig out the Tsilat had reportedly gotten into disagreement about how to go on with the process. Kasim also spoke of “inscriptions written in a foreign language” on the sword that he says was found during the excavation. After a year and tiresome activities the said church first built in the 4th century during the time of Abreha WeAtsebeha, was dug out and officially consecrated on January 13, 2007 in the presence of high church officials, and named Dagmawi Eyerusalem Yerer Sellasie Gedam. Now that the church is fully reestablished, tourists visit it every day in large numbers. The church holds a number of historical and spiritual articles that are invaluable to the country. History has it that Ethiopia was christianized in the 4th century AD by two brothers from Tyre—St. Frumentius, later consecrated the first Ethiopian bishop, and Aedesius. They won the confidence of King Ezana at Aksum. It was this church that was built during this century which lasted hidden till today and came out phenomenally. 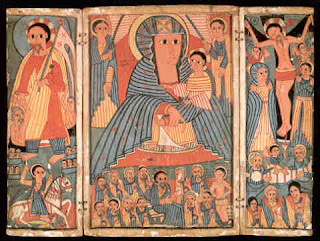 In addition to Ethiopia being one of the earliest civilizations, it is also one of the oldest Christian nations in the world. 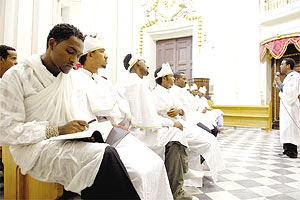 The Ethiopian court (governing officials) was first introduced to Christianity in approximately the year 42. A visitor who first went to the place said that he was really astonished by the man’s (Kassim) gift from the Lord and the things that were found in the place. Like this monastery many others are found all over the country, the miracles that were revealed in this location are puzzling to all. The courageous man’s attempts finally bestowed fruit. “I have a great belief that this place has a blessing for the whole Ethiopia and even to the world. All of us have to come to this historic and fascinating place and visit it. For this to come true around 800,000 birr was invested, including labor, material and cash contributions,” he told Capital. There are other miracles that remain to be revealed yet. But Kassim is still facing problems and discrimination from the residents of the area (farmers) who fear eviction. The entire event has been filmed and recorded, and endeavors to make it public are underway. Another Ethiopian Eritrean war? Pathetic! ሌላ የኢትዮጵያ-ኤርትራ ጦርነት? ዕብደት ነው! 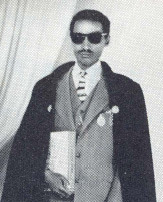 በእውነቱ ሁለተኛ ዙር 70 እና 80 ሺህ ነፍስ መገበር ዕብደት ካልሆነ ምንም ሊባል አይችልም፡፡ ነገሩ ለሽማግሌ አስቸግሯል፡፡ ‹‹አብረን እንኑር›› ሳይሆን ‹‹ወይ አንተ ወይ እኔ›› ስለሆነ ‹‹አንተም ተም! 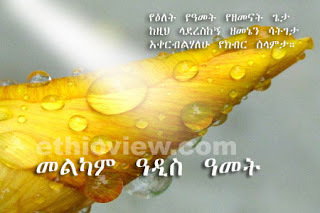 አንተም ተው!›› የሚላቸው ጠፋ፡፡ ቢኖርም አይሰሙም፡፡ ችግረኛ ሕዝቦች እየመሩ የሌላውን ተቀናቃኝ ስለመርዳት፣ የሌላውን ሀገር ስለመበጥበጥ መጨነቅ ምን ይባላል? This verse is quoted from the renowned hymn sung in remembrance of the flight of the holy family to Egypt and later to Ethiopia. The occasion is remembered in the Church from Meskerem 26 to Hidar 6 (Ca. Sept 7-Nov 6). According to Matthew, when the Magi came to Herod the Great in Jerusalem and asked where the newborn "King of the Jews" was, he became paranoid that the child would become a threat to his throne, and sought to kill Him (2:1-8). Herod initiated the Massacre of the Innocents in hopes of killing the Child (2:16-18). But an angel appeared to Joseph and warned him to take Jesus Christ and his mother into Egypt (2:13). Egypt was the logical place to find refuge, as it was outside the dominions of King Herod, and throughout the Old Testament it was the standard place of exile for those unsafe in Palestine. At the time in which the story of the flight is set, both Egypt and Palestine were part of the Roman Empire, making travel between them easy and relatively safe. The flight did not end in Egypt alone. 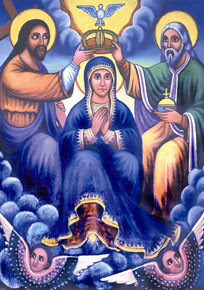 The Holy Family, according to the Ethiopian Orthodox Church tradition, continued their journey to Ethiopia and get shelter in places such as Islands in Tana lake. "I think that's where we're heading. We're heading there because the West has been in denial for a long time." The venue of this festival itself, is a marvel. Flying over, one can see the naturally crude cruciform-shaped land feature of Geshen. Girdled by sheer cliffs in all directions and with only one access, the church is perched at the top of a hill and had played a significant role in the political history of Medieval Ethiopia as the "Royal Prison." Later, Emperor Dawit is said to have brought a piece of Christ's cross from Egypt. Later yet, it was Emperor Zara Yacob, said to be led by the Holy Spirit who brought this treasure to it's present location at Gishen, thus the celebrations are associated with him. The Eve of the festival falls on Oct 1 with the main celebration on the following day. The 1992 split in the Ethiopian Orthodox Church in Jamaica has finally been resolved by the Supreme Court. Mr. Justice Donald McIntosh has ordered the followers of the late Archbishop Abuna Yesehaq, who were running the church over the last 15 years, to hand over control to the duly appointed board of trustees. Kenenisa Bekele dropped off the pace a couple of times during the last two laps of the 10,000 metres, and it looked as if lost his bid for the world title. But it wasn’t to be. Bekele was only kidding. He made up the gap which had been forged before the bell by the little known Kenyan, Martin Irunqu Mathathi, then tracked Sihine past the 200 metres line before launching a killer sprint to another distant victory in a rapid (for the conditions) time of 27:05.90, a season’s best for the World record holder. 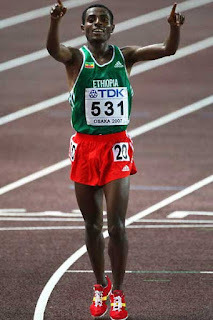 Our great tracking King Sileshi made it a one-two for Ethiopia, in 27:09.03, and Mathathi was third in 27:12.17. Aleka Ayalew Tamiru, Renowned Theologian, Leading Peace Advocate, Passed Away last week. He was a prominent scholar and leading EOTC theologian for not less than 40 years. Here is a poem dedicate to him by Insermu Seifegabriel. Aleka Ayalew Tamiru, Renowned Theologian, Leading Peace Advocate, Passed Away. He was a prominent scholar and leading EOTC theologian for not less than 40 years. Aleka has fallen apart with the 5th patriarch Paulos due to doctrinal issues, and the patriarch, in turn, stripped Aleka off his position, job and even salaries. He passed the last decade in his one meter by one meter Tselot Bet, reserving himself to writing and prayers. The death of Aleka is a great loss to the 200 years old Church. It is a shame the EOTC administration, once again, doomed its own precious asset and knowledgeable person of his time to seclusion and later death. Ethiopian Bete Kehenet can not have a simple web page, which here, every teenager and small parish cherishes. It is always hard even to get telephone and postal addresses of the Ethiopian Orthodox Tewahedo Bete kehenet. And now they have got a well designed, unfortunately not fully loaded (content wise) website. It is a good start. I wish the designers and editors of the site will update it as regularly as possible. As it is common with the newspaper (Zena Betekrestiyan) and other publications, please do not make it only about and to Abba Paulos. Tell us about the day-to-day activities of the Church. Teach us about our faith. Tell us about social and religious developments. Do not make it another venue of cyber war with your fellow Menekosat here in diaspora. 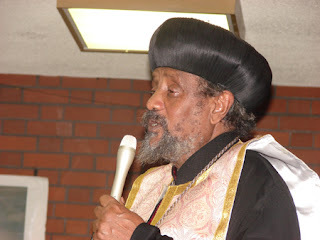 "We were Christian [charitable and monotheistic] for over a thousand years before Christ," Abba Paulos, Patriarch of the Ethiopian Orthodox Tewahedo Church, declared nonplused. "We have been Christian since Queen Makeda [the biblical Sheba] visited King Solomon in Jerusalem to partake of his wisdom and returned to Ethiopia with the Ark of the Covenant -- containing the actual stone tablets of the Ten Commandments God gave Moses," he explained. This is an article by Gamal Nkrumah and posted on Al-Ahram. This is an article by Diana West of The Washington Times excerpted to fit Deje Selam. It is another example how Islamist Jihadists and their Allies are undermining even what the West is doing. If they are influential here in Europe and North America, what do we expect them to do back home in Ethiopia. To read the whole article, click on the Title page. On Aug. 1, Chauncey Bailey, editor of the Oakland Press, was murdered. Mr. Bailey had been investigating what sounds like a black Muslim crime family operating out of Your Black Muslim Bakery, and its connections to crime in the Oakland area, where, not incidentally, Muslims associated with the bakery have used violence against liquor stores, a la Taliban, to enforce aspects of Islamic law. A 19-year-old Muslim bakery employee has confessed to the crime. Also on Aug. 1, the Web site, Radar, recounted a familiar tale of Hollywood woe — a screenplay project terminated by a producer before completion. But this one had a post-September 11 twist. The screenwriter, Jason Ressler, maintains that his screenplay, "Dove Hunting," a thriller with a Saudi prince for a villain, was terminated after the producer he was working with, Mark "March of the Penguins" Gill, received a massive infusion of cash from backers including, well, a Saudi prince: Sheikh Walid al-Ibrahim, an owner of al-Arabiya network and a brother-in-law of the late King Fahd. Mr. Gill denies politics affected his decision. On Aug. 2, the Young America's Foundation was threatened with legal action by lawyers for the Hamas-linked Council on American-Islamic Relations (CAIR) if the conservative student group didn't cancel a scheduled talk on CAIR by best-selling author and Islamic expert Robert Spencer. To be sure, neither the redoubtable Mr. Spencer nor the student group buckled under CAIR's bullying, and, to date, CAIR's threats have not materialized. 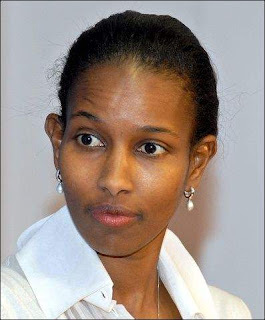 Indeed, both Mr. Spencer's resolve and Young America's Foundation response — "CAIR can go to hell and take their 72 virgins with them" — are an inspiration. There's even a bright spot in the Cambridge disgrace. The two American authors of "Alms for Jihad," J. Millard Burr and Robert O. Collins, were not sued; just the British publisher. For this protection, we can probably thank courageous Rachel Ehrenfeld, terror expert and author of the 2003 book, "Funding Evil." When Miss Ehrenfeld was sued in 2004 by the same litigious Saudi billionaire in British court (he has brought or threatened suit 36 times on similar grounds), she refused to accept the premise that a British court should have jurisdiction over an American writer's American-published book. She took legal action in U.S. courts, where, to date, her case is finding protection for American writers from British law. We can take heart from such victories. But these individual acts of courage will only amount to gallant sacrifices if they aren't upheld as victories over a jihadist effort to shut the rest of us up to curb everybody's freedom to name the Muslim billionaires behind global jihad, to investigate the thuggery of an Islamic city gang, to create thrillers about Saudi terror-princes, to speak out about CAIR's jihadist links and more. Nineteen expatriate Ethiopians of different religious faiths have set out in a small fleet of cars from the Hague, Holland, on a special pilgrimage - the "Amen Ethiopia Pilgrimage of Hope“. To read the whole article, please click HERE. Their final destination is the Ethiopian capital, Addis Abeba. The group of predominantly young people is hoping to reach the Ethiopian capital by the 12th of September at the latest, so that they can celebrate New Year's Day there - since according to the Ethiopian calendar this day is January 1 of the Year 2000. Their 40-day journey will take them through Europe, Asia and Africa. The Catholic charity Aid to the Church in Need (ACN) helped fund one of the vehicles. The members of the group are hoping by means of their journey to express their solidarity with their mother country and at the same time to appeal for a nationwide reflection on how to bring about a better society in Ethiopia. The Pilgrimage of Hope aims to bear witness to the riches of diversity in the country and call for spiritual unity in the new millennium. One of the pilgrims, Samra, a Catholic from Texas, USA, hopes the journey will bring about a new awareness of the need for peace. "In this group of young people I have an opportunity to gain an insight into the different religious perspectives", she told ACN, adding that she feels she can learn a great deal from those of other religions or denominations. As for Jonas, who is Orthodox and lives in the Netherlands, the central issue is peace. "We want people in Ethiopia to come together in the third millennium", he says. Jonas is not looking for a grand New Year's festival. Instead he sees this day as the starting date for changes in Ethiopia. "People there must reflect more on their own problems and strive together to find solutions for the country", he adds, adding that this is also the task of the different religious communions and ethnic groups. Prince Asfa-Wossen Asserate, a great-nephew of the last Ethiopian Emperor, Haile Selassie, told ACN that he sees the Pilgrimage of Hope as a signpost for the future. He hopes it will contribute to a new spirit of peace in Ethiopia. He also wants the pilgrimage to "reinforce the enormous presence of ecumenism between the Catholic Church and the Ethiopian Orthodox Church". The Prince is hoping the approaching millennium celebrations will mark a milestone of understanding among the numerous different ethnic groups who live side by side in Ethiopia. The 58-year-old management consultant added, "My wish is that the new millennium can be an era in which the three Abrahamic religions can live side by side as brothers and sisters." Two priests serving the Ethiopian faithful in the Netherlands, Abba Tesfamariam L. Mersha, who Is Ethiopian Orthodox and Abba Petros S. Berga, who is Catholic, will be accompanying the Pilgrimage of Hope. Both men believe that this religiously mixed group of pilgrims can bear special witness to the idea of unity in diversity. The discussions and contacts made during the pilgrimage can, they believe, contribute to overcoming the problems which exist in their home country. They are hoping above all for reconciliation, dialogue and mutual respect. After their arrival in Addis Abeba, the vehicle funded by ACN will be given to the Theological College of the Holy Trinity in order to serve the only theological institution of the Orthodox Church in Ethiopia. ACN over the years has supported a number of ecumenical projects for the Orthodox Church.